# 8: The Thousand-Mile Speaker. from A Short History of the Attempt to Capture the Human Voice in 37 Objects. 一 Any history of the attempt to capture the human voice would be incomplete without mention of Chiang Shun-hsin and the “thousand-mile speaker.” This “ingenious device,” referenced in translations of several provincial encyclopediae of the Qing dynasty as well as the miscellany of an unnamed Chinese scholar from the province of Fujian (bought at auction under a lot entitled Arcana of the East) was “a cylinder of copper, likened to a fife, containing an artful device, that, once whispered into and immediately closed, the confined message, however long, may be conveyed to any distance.” All information about the purported device set its invention to the mid-period of the Qing dynasty, established after “Manchu tribes swept down from the north and quickly dispatched the previous regime”, subsequently claiming they had a mandate from heaven to rule, and, in particular, connect its appearance to the rule of the Kangxi Emperor, who is widely celebrated for his longevity, the creation of a comprehensive dictionary of the language, and his interest in Western science and technology facilitated through relationships with insistent Jesuit missionaries. No records of the “thousand-mile speaker” exist after this period. The “miraculous device” is thought perished with the man who made it. 二 It was spring and despite certain setbacks the empire was still expanding. This is what the minister told Chiang Shun-hsin. Chiang Shun-hsin, who had accurately predicted the previous spring’s flood, who knew the many and (often) secret properties of metal, and who had, according to more than one witness on more than one occasion, been seen in intimate conversation with a muster of storks, which, because of their migration patterns and feeding grounds were able to impart all manner of valuable information about the nature of things, seen or unseen, and so was now being summoned by the Emperor. They were walking through a series of narrow hallways, lined with billowing drapes, yellow, aquamarine, red (he could not quite understand the patterns), he and the minister, and Chiang Shun-hsin, who had been traveling for more than a week, down the Delta river and into the sea, felt dizzy with fatigue and anticipation. He kept a mental tally of the directions as they walked: right, left, right, left, left, right, though it was hard to tell, as they maneuvered through the narrow corridors, the billowing fabric lightly brushing against his face, his arms (there must be chambers in the wall and openings to force the air...), and then suddenly the councilor turning left or right and walking into curtains, between them and then into another corridor (quickly, quickly), where one pathway ended and another began. The empire was still expanding, the councilor was saying, even after challenges to the south and the Russians and Mongols at the border. Consolidation can be difficult but it does not have to be violent. Men of our age understand what might have been, the minister went on. The floods, the corruption; how it all could have fallen apart. We understand, the minister said, what this Emperor has accomplished. Consolidation. Chiang Shun-hsin knew what this meant, knew the minister knew— the boyhood humiliation of having his hair cut to fit the Manchu style— “lose your hair to keep your head”—and then his uncle, exhausted from the journey south, saying that everything was gone (though he should have been sleeping, he stayed up spying), saying the entire city . . . nothing but corpses, bodies piled on every street. Headless. Human meat. But with such expansion comes specific needs, the councilor was saying. Chiang thought also of the rumors he had heard, the foreign priests who wore the robes of the elite but wore their own robes in private, of rites practiced in secret where terrible things were said to be consumed, more for every moral failing. But he will explain it in more detail, the minister said. Suddenly there was the smell of what he knew to be sacrificial offerings and also music. Of course, Chiang Shun-shin said. Of course. 三 The Emperor was a small man. He told this later to Hwei-ru, as they sat in the courtyard of their home, the cloud-smeared night sky pressed down upon them, an impenetrable mass. Slight. With an oval face and long delicate moustache. What had he imagined? Emperor . . . the word itself seemed expansive: thick-fingered, broad-chested. He wished he could see her face better, see her bathed in moonlight. The lamps around them gave her a soft yet sinister quality. She, who had never despaired, even privately, despite stigma and the setbacks that had come with it. She and him, alone in a house that should be filled with voices, should have history. She twined her fingers in his and then untwined them. When the summons had come, a summons for him, Chiang, a mere clerk in a provincial division of the Ministry of Natural Works, he suspected (they both did) that it had to do with his father, a man who had served the previous regime loyally, faithfully, who had died, solemn yet distraught, of self-imposed starvation the previous spring. And because retribution could not now fall on him, the traitor, it must logically fall on his son. But he had already renounced him, his father. So what could the Emperor truly want? Nothing was certain. The summons had been a surprise, which itself was a surprise, which in turn had unsettled him. Did he somehow misread the signs or was it that there were no signs to foretell this sudden call, this forced entry by the most powerful of brigands into his very home? Or was it rather perhaps the revelation, so much the worse, that in fact there was no force at all, that the thief had been there, patiently waiting, in the darker corners of his house the whole time? He considered the wind and cracked bamboo, reading again the grains and breakage for portent, intimations of rupture. But the wind was only wind, the bamboo merely broken. What a strange sensation, he said to Hwei-ru, who smoothed his hair and said there is nothing to fear. What a strange sensation: to see no pathways at all. Was it the world or himself? Was this what it meant to be a ghost? But the Emperor was small and the room they were in was also small, nothing more than a chamber, a chamber with more billowing curtains, he said. Of course he had imagined an official greeting, to stand the Palace of Heavenly Purity, its obsidian floors, its high columns that seemed to hold the very vault of heaven, to tour the Hall of Mental Cultivation, where so many great scholars had stood, where the great encyclopedia and dictionaries had been complied, where the assembled official scholars had met and decided, in the words of his father, what was knowledge and what was not. But this was just a small chamber, it was nowhere, and for a while the Emperor sat playing a strange instrument. Something large, like a desk, that he pressed upon with his hands and the music that emerged was likewise strange. When he stopped, Chiang Shun-shin said to Hwei-ru, the music it seemed he was playing continued on around him. He was not playing at all. He was playing at playing. Occasionally the minister would disappear behind the curtains and whisper something and the whispers seemed to bounce off the walls. I did not know if in meeting in such odd and secret manner, he told his wife, I should feel relieved or resigned. For a while he stood there, now alone in the center of the chamber, and watched the Emperor play. “Chiang Shun-shin,” the Emperor said suddenly. He stopped his movements and now turned toward Chiang. The Emperor smiled at him. “Come. Sit,” the Emperor said and, rising from his instrument, walked to the solitary chair that faced Chiang and sat down, facing him. Chiang felt the urge to also sit, to comply with the Emperor’s command, but did not understand if he was to sit on the floor right there where he stood, where he had been lead, or if he was to go over to the Emperor and sit at his feet, like a beloved dog. He stood still. The Emperor kept his gaze. From curtains behind him there was a tittering and then something pressed against the fabric (this he didn’t speak of), something like a face. Then for a while the Emperor was silent. Chiang Shun-shin didn’t know if he was expected to answer. He felt suddenly tired. His head stuffed thick with wet cloth. The fatigue of travel suddenly catching up with him. He closed his eyes and when he opened them it felt for a moment that he had slept for a long time. “Chiang Shun-shin”, the Emperor said. “My lord,” Chiang said and then involuntarily bowed again. The Emperor smiled and Chiang Shun-shin began to feel heat flood his face and hands. It was as if, he suddenly felt, this whole audience, which of course was absurd because what good would that do the Emperor, as if this whole audience in some small way had been designed not to punish him but merely confound and humiliate him. Here it was: the trap. Chiang had two thoughts almost instantly and neither were satisfactory. Of course the empire was its people and of course the empire was the Emperor himself. Whatever was behind the curtain continued to move around the room. “A belief?” he said, which Chiang took as license or injunction to continue. This smile, Chiang Shun-hsin told Hwei-ru, was not the smile of before. It was stretched, too big. As if his mouth was controlling his face and not the other way around. And now around them, behind the billowing curtains the movement, the rustling and whispers, had ceased. He knew that they were alone he and the Emperor. Yet still he felt it was not so. He stood there for a moment, suddenly alone, and then followed him. 四 But the Chiang Shun-hsin that left to see the Emperor was not the one who returned. Of this Hwei-ru was certain. For example upon his return to Huizhou, Chiang Shun-hsin resigned his post and built a table in the woods near the river, where he took long walks or sat for hours listening to the river, the birds. He did not communicate. He only listened. Because the Emperor, he told his Hwei-ru, had not brought him to the capital to punish him or plunge the family into even further disgrace. Quite the contrary, he chose him for a magnificent task. He was to build something special. A device that could capture sound. All sound travels and then it dies, he said (he kept saying). Understanding how it travels is the key to understanding how it may be captured. Hwei-ru was not so sure. To her it seemed that sound did not die, that it went on and on, moving through us, and changing us ever so slightly in its passage. And moreover it seemed less that her husband was in thrall to his idea and more that he had been possessed by the ghost of his father, or that the more he was in thrall to his idea the more the possession took hold. As he worked conceiving his impossible object, the less he seemed himself. Though he ate, it was not with the same relish and his movements were distracted, mechanical. To watch others be consumed by something unknowable seemed to be her fate, all their fates and she remembered how his honorable father had looked toward his own end, before he too became something they could not hear, glassy-eyed, sunken—when she spoke, it took him a long time to answer and when he did it sometimes made little sense. What was he hearing that they could not, so close to the endless border? 五 It was quite simple, she explained to the foreigner who came after everything had happened, after Chiang Shun-Hsin had traveled to the northern border and not returned, after the Emperor had died and the new Emperor replaced him and, as these things happen, showed little interest in such inanities, and the world moved on without them all. He had come inexplicably, this foreigner, young, with dark hair and slight beard, barely a man. It was both strange and not strange, his coming to inquire after her husband all these years. She had known this story would find an end. And there he was: asking hesitantly if she was the wife of Chiang Shun-hsin, if she could tell him anything about her husband. He had come, she thought, looking at him, like they all came, like they had been coming, from the West with a certain knowledge of the heavens and stories of a supreme god. He had come, like they all came, with ghosts chasing after him. “What the Emperor wanted,” she told the foreigner, “was a method of sending his voice as far as possible.” She was an old woman now and all this was merely a story for a child. She poured tea for her guest and then herself. “You must understand,” she said. “It was a different time. A time of war and fragile peace and war and fragile peace. Such times,” she said, “create the conditions for forgetting.” With enemies at every border, it was important that the Emperor’s minister and Generals know the Emperor’s will and know that what was imparted was indeed the Emperor’s will. Because even in this time of relative peace there are always plots, germinating right there inside the heart of the empire, the city’s narrow streets, where those still loyal to the old empire, old and young, the forgotten subjects, with piles of corpses behind their eyes whispered words not even formed yet. To have his word be always the word, this is what the Emperor wanted, what he wanted from Chiang Shun-hsin. To have his voice spread far and wide, ringing in every subject’s ear, to be inside their heads—that, the old woman said, is belief. “The cylinder,” the foreigner said. “Yes,” she said. She did not seem surprised at his knowledge. They were sitting high on a mountain, below him the tea terraces, perfect in their articulation, circled the mountain in ever-tightening concentrics. The sky was cloudy and the sun was setting and Niccolo felt suddenly like he was in a painting, one he had often contemplated at seminary. It was a devotional in a small chapel off the nave. The painting was a version of The Temptation of St. Anthony and depicted the part of the story in which Anthony having dreamt that, should he truly want to commit his life to solitude and contemplation of the Lord and all creation, he must go in search of Paul of Thebes, who was his better and therefore closer to building the city of God desired by all. Wandering the desert in search of this most devout and isolated man, Anthony encountered a satyr and a centaur. In the story passed down by the early fathers, the sight of such creatures transfixed Anthony, who recoiled in horror. He found he could not move as long as he looked upon them and they upon him. Who are you, he asked them? We are corpses, they said. You are too beautiful to be corpses, he said. He had meant to say horrible but that other word came out of his mouth. One of them laughed; the other said: we are here to offer what we offer all men. A way back to the always was. A simple obstacle in Anthony’s path. The rejection, as noted by so many learned fathers, of false miracles, the forfeit of wonders of the flesh for purity of mind. In order to pass he had to close his eyes. The faces of the monsters mocked his eyes from behind his lids as he went. He could hear their breathing and their laughter. In the story Anthony moved quickly past them and onto his journey. But in this painting, unlike his understanding of the parable and the depictions in other paintings he would later see of the same story, the faces of the satyr and centaur seemed not twisted by lust but gentle and sorrowful. It is the face of Anthony, thin and ravaged, that seems deformed. This answer caught Niccolo off guard. Why wouldn’t she have it? Something so precious, a key, dropped from God’s own diaphanous hand, to the future. “It was your husband’s”, Niccolo said. “What do you mean?,” Niccolo asked. He felt something tighten in his chest. “Chiang Shun-hsin looked at the cylinder in disbelief,” she continued, “while the General looked at Chiang himself. All around them, outside the tent, the empire’s many hands, its soldiers and horses moved with a listless anticipation, waiting and dreading their use. Explain yourself, the General commanded my husband. But Chiang-Shun-hsin continued to look at his invention, or what he thought of as his invention, which had worked only weeks ago there in the capital, in the very presence of the Emperor, with perplexity. You cannot, the General said. Do you know why you cannot? The seal must have compromised, my husband said at last. My poor husband. Broken open in the night, somehow, before we could wake. The seal, he said. And the voice slipped away. Of course that’s it, the General said. The seal has been compromised. And not that you yourself have been compromised, discovered in your plan to take our great Emperor’s strategy to our enemies. And my husband, my poor husband, Chiang Shun-hsin was again dumbfounded. He commanded that the General write to the Emperor, who would surely clear things up. To which the General replied that everything was quite clear. It was now dark and Niccolo felt cold. All around them lamps had been lit. Even though the moon was full and out, the lamps were close around them. In their light, the woman looked to him both sad and beautiful. He felt stranded. The woman, he knew, would talk to him no longer. He thought of the long journey she described and his own long journey by boat toward something he had hoped would be the center but was not. Here was only the bitterness of death and ridiculous stories that proliferated in the void. He gathered himself to go. Because it was late and the mission was far enough away and who knew what prowled the roads, he would instead stay the night at the small inn in the town at the bottom of the mountains. He slept fitfully, awakening once in the night to something, a loud sound or a creaking, clutching at his pillow. There was an animal inside of it, his head, he thought and then shook off the thought. The room was quiet and dark. In the dream—it was surely a dream—he was here in this room at this exact moment thinking of the animal in his head. He rose from the bed to open the door because of the sound in the hall, there was something in the hall, and he opened the door slowly, carefully, but found nothing. There was just the hall. The sounds of an inn at night. Suddenly he knew to turn his head. And on the door to his room, there it was, some animal—was it the animal in his head?— a soft, brown, indistinct mass, bloodied, stuck to the door with a knife. He lurched back, in disgust and fear, slamming the door behind him. He heard disgruntled admonitions for the other patrons but did not care. Someone was threatening him. Someone knew what he wanted and was warning him. He began to recite his “Suspice.” Receive all my liberty, he said, my memory, and my entire will. He said it over and over and then it was morning. He woke—surely it was a dream—and rose and looked at his door. There was nothing there. Thank God. No mark at all. Niccolo left the inn, the town, the mountain. But he did not return to the Mission. Instead he traveled south by foot, through the moss-covered rocky hills of what was called by the locals “The Fairy Forest,” in hopes of finding, in some military vessel or merchant ship, passage back. 六 But of course because this is a story about empire there is another version of these exact same events, one that is told in different tones, sometimes in whispers, sometimes in the cadence of a joke. In this version, Chiang Shun-hsin and the General are again in the tent. And Chiang again presents the General the cylinder, which he holds gently, as if it were a small and soft animal, and then with ceremony breaks the seal, opens it. But this time—miracle of miracles!—from the most unusual object the Emperor’s voice does emerge, as if he were right there in the tent, urging his most trusted man to be vigilant, always vigilant, and do his best to keep the peace. The General is astonished. He bows to the voice coming from the small copper device. It is a miracle, he says to Chiang. You have performed a miracle. A miracle is something rare, a bolt from the heavens that strikes us once or an encounter with a creature both monstrous and beautiful, something that transforms us irreparably, Chiang Shun-hsin replies. What I have done, he says with pride, is create the future. The men smile at each other—wide, wide smiles—in camaraderie. But then suddenly another sound emerges from the cylinder. It sounds like the wind all around them but in it Chiang and the General can hear (but not understand) voices, speaking together and separately, a babble, a commotion. It is a terrible sound, both animal and unearthly, and the General drops it, the thousand-mile mouth, on the ground where it rolls, howling, to the edge of the tent and the horses buck and bite the air while men shiver under furs, pretending to sleep. The sound burrows into the mind of every man in camp and remaining inside their heads, an ever-present hum. It is everything, Chiang and the General suddenly understand—Chiang can see it all—that is to come. The turn of the century and the next and the next. The cylinder howls and howls and then it stops. It is quiet again. It is only the tent, the night. Chiang Shun-hsin and the General do not look at each other. Will not. But for now there is this, the General tells himself. This border. This Emperor. This duty. There is this, he says out loud, to Chiang. But Chiang Shun-hsin has already walked out of the tent through the camp and into the endless desert to behold, he says himself as he goes, the future. 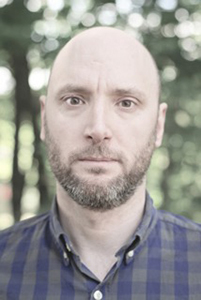 Gregory Howard teaches creative writing, contemporary literature, and film studies at the University of Maine. His first novel Hospice was published by FC2 in June 2015. His fiction and essays have appeared in Numero Cinq, Web Conjunctions, Harp & Altar, and Tarpaulin Sky, among other journals. He lives in Bangor, Maine with his wife and cats. Schoodic is about an hour and a half from where I live in Maine. It is one of the first landscapes that made me understand where I had moved to when I moved here from the West. It’s a place of extremes: incredible beauty and amazing violence. The waves come crashing against the rocks. The pine trees abut the water. It place of edges and borders and compels you always to look outward and inward at the same time.